We have huge news coming out of yesterday’s Primary Election! Environmental candidates across the state are leading against anti-environmental candidates as they move on to the November General Election. All eyes were on three key congressional elections where environmental candidates went toe-to-toe against longtime incumbents. Of note is in eastern Washington’s 5th Congressional District, where LCV-endorsed Lisa Brown is nearly tied with climate change skeptic U.S. Representative Cathy McMorris Rodgers. Senator Patty Kuderer (LD 48) gained nearly 60% of the primary vote, giving her a strong lead against Rodney Tom (25% WCV Scorecard score) for State Senate in east King County. Environmental champion and current Issaquah Council Member Bill Ramos (LD 5) is up 7 points against his Tea Party opponent who is backed by Big Oil. Emily Randall (LD 26) in Kitsap County gained over 50% of the votes in her three-way contested primary for State Senator where she faces an anti-environmental opponent who supports Donald Trump’s policies. Climate change denier and former chair of the Senate Environmental Committee Doug Ericksen is even down by 9 points in his race in Whatcom County. The primary results show that in seats currently held by an anti-environmental legislator, there are up to 15 competitive House races and 4 competitive Senate races. This is significantly more competitive seats than we have seen before in recent years! With the current slim environmental majorities in the State Legislature, every seat and every new environmental champion matters – and this November, we have the opportunity for big wins that could change the environmental makeup of the legislature. Although we are celebrating many wins from Tuesday, the election is far from over. The oil industry has already poured over 1.6 million dollars into Washington state elections and it’s going to take a tremendous amount of people power to fight back and secure wins for environmental champions across the state. That’s where you come in. We need more volunteers on the ground in more districts to take advantage of the energy from Tuesday night. 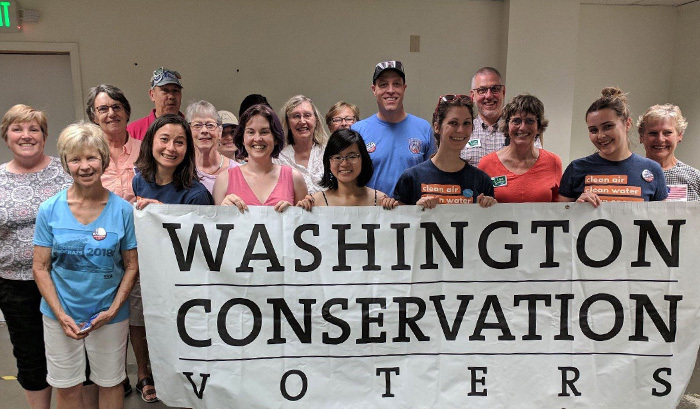 Sign up to volunteer to elect WCV-endorsed candidates this election season!